Last night I finally made it to the second run theater across the street from my office to watch Danny Boyle's 127 Hours. I'd been excited for this movie for some time, having seen Aron Ralston when he visited my high school a few years back (he'd dated one of the teachers). 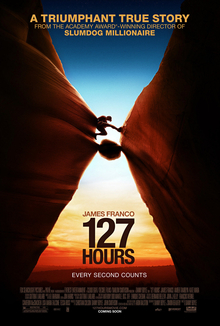 After hearing what 127 Hours star James Franco said about the differing filmmaking styles of his film and The Social Network, that TSN was conventional compared to 127 Hours' innovation, I was curious to see how watching a guy become dehydrated and desperate over five days could stay interesting...at least until he cuts his arm off. And I have to say, the movie sped by, particularly to the credit of Boyle and editor Jon Harris. James Franco obviously carries the movie, as the camera doesn't often give us wide shots of him, instead staying in close, forcing us to feel Aron's claustrophobic situation, watching in detail as ants crawl over his increasingly pallid skin. Much as I like initial casting choice Cillian Murphy, Franco is so much more obvious and perfect as Ralston, playing him as detached and lonely, but with a verve that keeps him sympathetic in his almost-craziness. Franco also has that strange ability to be classically, smoulderingly, handsome from one angle, and hobo crazy from another, so roles that allow the eccentricity to flow through are probably the best showcases for his talent. This movie, perhaps unlike many others based closely on true events, benefits from the assumption that audience members already know how the story will pan out. "Let's go see the movie where James Franco cuts his arm off." So when the movie starts off with Aron unable to find his trusty Swiss Army knife, in plain view of the camera, that feeling of dread sets in that will carry you through to the stomach-turning climax. When he starts chipping away at the boulder with his dull pocketknife, I found myself pleading with him not to make it any duller, as if I wanted to warn him that the killer was inside the house. You know Aron will survive, so when you see him videotaping his final goodbyes and drinking his own urine to stay alive, it forces the audience to wonder how they would have acted in his situation. It's easy to judge Aron Ralston for bringing the situation upon himself. The movie adequately portrays this issue, and surely Ralston himself knows that he could have saved himself a lot of misery by informing anyone as to his whereabouts, or being better prepared for his excursion. But how would you have acted if it had been you trapped under the boulder? Would you have waited five days without food and water before trying to free yourself? Would it ever occur to you to have done what he did? At a certain point, would you just try to kill yourself quickly? * Perhaps only in a state of delirium and shock can the ultimate survival instinct kick in. The film portrays Ralston as hallucinating visions of his family, of his future son, and that being what spurs him to finally go through with it. 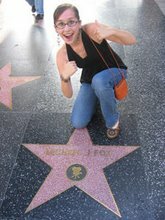 In the end, I didn't know whether to feel inspired (or vow never to take up rock climbing), but the final scenes of Aron, post-amputation, rappelling to the ground, marching through the midday sun, and eventually finding rescue, water, a modicum of fame, and a family, were expertly shot and cut together. There is some magic to be found in the triumph of the human spirit, and it is both crazy and admirable how Ralston has continued mountaineering in the years since his accident. I feel like so many of us resign ourselves to letting life speed by, with hours stuck behind a computer screen, missing out on so many opportunities for adventures of all sorts. After 127 Hours, I do have an itching to go on a nice - safe - hike this weekend. In Soviet Russia, Iron Invades You! No more than meets the eye.